Numerous water customers saw radical jumps in water bills from one bill to the next from January 2017 through February 2018, a VOSD and NBC 7 analysis shows. Over 1,000 city of San Diego water customers have complained about bill spikes and other billing problems so far this year, hundreds more than the city has previously acknowledged and far more than in recent years. But the number of customers who experienced dramatic bill spikes could be even higher than just those who’ve complained to the city. 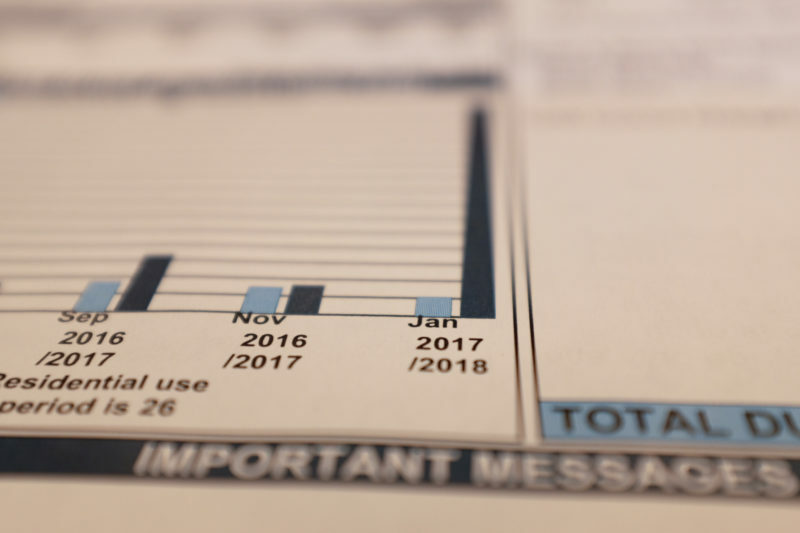 Hundreds if not thousands more customers experienced billing spikes in 2017 and early 2018, according to an analysis of water department billing records by Voice of San Diego and NBC 7 Responds. Data from a 14-month period – January 2017 through February 2018 – show numerous water customers saw radical jumps in water bills from one bill to the next. Over 2,500 customers saw their bills at least double from one billing cycle to the next, and some saw increases of 500 percent or more. The city argues there’s no proof this is abnormal, and records released by the city make it impossible to determine whether the spikes are mistakes or reflect a legitimate surge in use. The city argues a confluence of justifiable factors explain most spikes: rising water rates, increased water use coming out of a drought, leaks, filling pools, and family and friends visiting. Also, customers with newly installed water meters could see their bills spike because older meters may have been undercounting use, essentially giving people free water. Yet the city also acknowledges that its own staff may be making errors, such as the meter reader blamed earlier this year for screwing up 343 bills in the Carmel Valley, Mira Mesa, Rancho Bernardo and Rancho Peñasquitos neighborhoods. VOSD and NBC obtained billing records from the city, though the city withheld customers’ names and addresses. That means it was possible to see bills fluctuate wildly but impossible to contact customers to see whether there was an explanation for the billing issues. We took what records we had and looked for increased water use and charges among single-family homes that were 50 to 70 days apart, since the city issues bills every two months. The analysis also focused on customers who had bills that were initially $80 or more. Using those parameters, more than 2,600 customers saw a water use increase of 100 percent or more. On average, those customers saw increases of $238 from one billing cycle to the next. Our analysis found the highest number of increases occurred in La Jolla, Scripps Ranch and Rancho Bernardo, where homeowners began complaining about what they said were abnormally and unjustifiably high water bills months ago. The analysis found La Jolla had the highest number of customers who saw their bills double and more than 50 customers had their bills quintuple. Those also happen to be places where wealthier customers with bigger yards may see use go up and down based on how much landscaping they are doing, what the weather is and if their pool is refilled. Consumer advocates have argued for years that once low-income customers fall behind on their bills, they face a labyrinthine process to get caught up, because of problems with the water department’s billing practices. Now, following complaints from water customers in wealthier areas about billing spikes, two audits are underway. Both groups of auditors are combing through city data to try to find out whether the complaints and billing spikes are explained by rising water use, are routine errors any large utility may experience or are a systemic problem. Earlier this year, the city admitted that several hundred customers’ bills had been misread, something it blamed on a single meter reader, but Mayor Kevin Faulconer ordered city auditors to take a deeper look at the department. So far, 1,087 city water customers have complained about bills this year. Typically, a few hundred or less each year lodge such complaints. The city downplays those numbers, though, by noting that it has over a quarter million water customer accounts. The department didn’t say how many of the complaints it received were substantiated. It said only that “there may be other customers who received incorrect bills due to misreads or other issues” but then said “many” were justifiably high. Last year, NBC began an investigation of billing problems based on complaints about crazy high water bills. Since then, the city has confirmed some errors but denies there are systemic problems with how it charges customers for water. Yet, more people than usual are coming forward with complaints about billing errors – either because there are new problems, or because increased media attention prompted them to look more closely at their bills, or some combination of both. City auditors and West Monroe, the outside consultant hired to review the city’s billing practices, are doing separate audits but both are looking for similar problems with water department staff, billing software and water meters themselves. In the past, the city had a staffer known for trying to catch billing errors. About a year ago, though, the staffer died, said Roger Bailey, the former head of the water department. That position is unfilled now, though the department said it has put other new measures in place to make sure errors are caught and has a long-time staffer in another position who is supposed to ensure quality billing practices. Bailey said he wondered whether recent billing problems were a result of that death and the vacant position. “Something broke down there in the process,” Bailey said. Correction: An earlier version of this post said the average water bill in San Diego is roughly $80. Surveys have found $80 is roughly the average monthly cost of water, but the city bills customers every two months.